Theodore Paul Hendricks (born November 1, 1947) is a former American football linebacker who played 15 seasons for the Baltimore Colts (1969–1973), the Green Bay Packers (1974) and the Oakland and Los Angeles Raiders (1975–1983) in the National Football League (NFL). He was a member of four Super Bowl-winning teams, and was elected to the Pro Football Hall of Fame in 1990. He is distinguished as being the first Guatemalan to play in the National Football League. Hendricks was born to a Guatemalan woman named Angela Bonatti Lazzari in Guatemala City where his father was employed, and was raised in Miami Springs, Florida. He attended Hialeah High School and was a standout player for the T-breds. Ted was raised bilingual and speaks fluent Spanish. Hendricks played college football at the University of Miami. He played stand-up defensive end for the University of Miami during the 1966 through 1968 seasons. He was a two-time All-American (1967 and 1968) and finished fifth in the 1968 Heisman Trophy voting. He was also a second-team All-America selection in 1966. While in college, Hendricks became a member of Kappa Sigma Fraternity. While playing for Miami, Hendricks made 327 total tackles (the most ever by a Miami defensive lineman). He also led the team in solo tackles by a defensive lineman with 139. Hendricks also recovered 12 fumbles during his playing career. He recorded a career-high of 4 quarterback sacks against the University of Florida in 1968. In his junior year of 1967 he caused nine turnovers. It was at Miami that the tall, thin Hendricks gained the nickname “The Mad Stork.” It was a nickname that would follow him until his NFL days when he was simply called "The Stork". Hendricks' Miami jersey was retired in 1997. He was elected to the College Football Hall of Fame. Hendricks was inducted into the University of Miami Sports Hall of Fame in 1980. Hendricks began his pro football career as a second-round pick of the Baltimore Colts in the 1969 AFL-NFL Draft. He was initially listed as a defensive end, which is why he had the unusual number (for a linebacker) of 83. After coach Don Shula converted him to linebacker, he entered the starting lineup halfway through his rookie 1969 season. He made 32 tackles and 2 sacks on the quarterback and knocked down 2 passes and blocked a field goal (the first of 25 blocked kicks in his career). He played a key role in the Colts' 1970 Super Bowl V-winning season. He was the starting strong-side linebacker and recorded 67 tackles and 1-1/2 sacks while intercepting a pass. He also recorded 2 blocked kicks and knocked down 5 passes. He and fellow linebackers Mike Curtis and Ray May anchored a unit that was one of the NFL's best in defending against the run; which was 102.8 yards per game – 6th in the NFL, and allowing only 2 rushing touchdowns all season (tied with the Los Angeles Rams for first in the NFL). They allowed only 234 points, 7th in the NFL. He was chosen to the first of four All-Pro selections in 1971. He had 63 tackles and picked off 5 passes while batting away 7 passes. He also recorded 5 sacks and blocked 2 more kicks. The Colts defense was ranked #1 in the NFL in fewest rushing yards allowed and lowest rushing attempt. The Colts made the playoffs but did not advance to the Super Bowl, losing to the Miami Dolphins. In 1972 Hendricks recorded 99 tackles, 6 sacks, knocked down 7 passes, intercepted two passes and blocked 2 field goals. The following season Hendricks made 86 tackles and 4 sacks (bringing his Colt total to 18-1/2) and picked off 3 passes (making his Colt total 11) for 33 yards, while batting away 7 passes for the third consecutive season and blocking a punt. He was second-team All-Pro in both 1972 and 1973. After five seasons with the Colts, he was traded to the Green Bay Packers. After Hendricks was traded to the Packers, he was assigned jersey no. 56 and signed a 'future contract' with the nascent World Football League. Hendricks was then in the option year of his NFL contract, and had one of his best seasons: five interceptions, seven blocked kicks (3 field goals, 3 punts and 1 extra point) and a safety, two sacks, 75 tackles, and two knocked down passes while again earning consensus All-Pro honors for the second time. With the World Football League bankrupt, owner Al Davis of the Raiders sent two first round draft choices to the Packers for the rights to Hendricks, signing him as a limited free agent. After the trade, Hendricks went on to nine seasons with the Raiders before retiring after the 1983 season. In his first year on the Raider team, coach John Madden used him sparingly, partly as a result of a feud Madden had with Al Davis. However, Madden eventually had him starting by the end of the 1975 season. Hendricks recorded only 27 tackles and 3 passes batted and 2 interceptions. He was used in the Raiders nickel defense and recorded 5 sacks in that role. He also recorded 4 sacks in a playoff win against the Cincinnati Bengals. Injuries limited the number of defensive lineman Madden had available so he used Hendricks as a stand-up defensive end, the position Hendricks played in college. At season's end the Raiders defense was among the NFL's top units, despite injuries to a few key defensive linemen. The Raiders led the NFL in interceptions and they ranked 2nd in the NFL in sacks, 7th in fewest points allowed, and were 3rd in total defense. The next year Hendricks became a full-time player with the Raiders, and the Raiders switched to a 3–4 defense early in the season. Hendricks played the weakside linebacker, since All-Pro Phil Villapiano played Hendricks' strong-side; he made 57 tackles, 6 sacks, knocked down 5 passes while picking off one and blocking 2 punts. The Raiders defense was 6th in the NFL in sacks but did not finish in the top ten in points allowed or total defense. The Raiders won Super Bowl XI, the first in franchise history, and the first of three Super Bowl titles in seven seasons. Hendricks was second-team All-Pro for the first of three consecutive years. In 1977 Hendricks moved back to the strong-side linebacker position due to Villapiano's injury and made 56 tackles, 2 sacks and knocked down 4 passes. The Raider defense was 7th in the NFL against the run and tied for 3rd in allowing the fewest rushing touchdowns. They also tied for third in the NFL with 26 interceptions. In the 1978 season Hendricks recorded a stellar season with 78 tackles, 6 sacks, 3 interceptions, 8 passes defensed and 2 fumble recoveries. The defense tied for 4th in most interceptions in the NFL and scored 4 defensive touchdowns which tied them for 2nd most in the NFL. They were tied for 10th in fewest points allowed as well. By the end of the 1979 season, it appeared that the career of "Kick 'em in the Head Ted" (his Raider nickname) was over even though he made 61 tackles with 3 sacks and picked off a pass, returning it 23 yards for a touchdown and deflected 13 passes. The Raider defense picked off the 8th most interceptions in the NFL and scored 4 defensive touchdowns, leading the NFL in 1979. A vote among Raider coaches showed that all of them had voted to release Hendricks at season's end. However, owner Al Davis insisted on keeping Hendricks. Hendricks ended up making 76 tackles with a career high 8-1/2 sacks, 3 interceptions (bringing his career total to 26) while batting 16 passes and blocking 3 kicks. The defense rebounded to #5 against the run in the NFL, #1 in intercepting passes, and were 3rd in sacking opponents quarterbacks, and 11th in the NFL in total defense and 10th in fewest points allowed. In 1980 he was a consensus first-team All-Pro for the first time since 1974 and he helped the Raiders to their win in Super Bowl XV while going to another Pro Bowl. Hendricks was All-Pro and All-AFC in the strike-shortened 1982 season as Hendricks made 28 tackles and seven sacks in just nine games while he deflected 2 passes. The Raiders were 8–1 but were stunned in a playoff loss to the New York Jets. The Raider defense was as good as there was in the NFL for the 1982 season. They were 2nd in fewest rushing yards allowed and 2nd in sacking the opposing quarterback. In his final campaign, 1983, Hendricks played less than at any point since 1975 but still made his eighth Pro Bowl and was second team All-AFC while recording 41 tackles, two sacks and deflecting four passes. He also blocked the 25th kick of his career and was a part of the Raiders Super Bowl XVIII victory. The defense was 4th in the NFL against the run, again tied for 2nd in sacking the quarterback, and fifth in total defense and 13th in allowing the fewest points allowed while being eighth in allowing the fewest touchdowns from scrimmage. Hendricks was a member of four Super Bowl-winning teams (three with the Raiders and one with the Colts) and was a Pro Bowl selection eight times, at least once with each of his three NFL teams. Hendricks played in 215 straight regular-season games. He also participated in eight Pro Bowl games, seven AFC championships and four Super Bowls (V with the Colts, XI, XV and XVIII with the Raiders). Hendricks was named All-Pro as a Colt in 1971, as a Packer in 1974, and twice as a Raider in 1980 and 1982. He also earned second-team All-Pro honors five other times (1972, '73, '76, '77, '78). He also earned All-conference honors in 1971, '72, '74, '76, '80, '81 and '82, while being named 2nd-team All-AFC in 1973, '78 and '83. Hendricks was elected to the Pro Football Hall of Fame in 1990, his second year of eligibility. In 1999, he was ranked number 64 on The Sporting News' list of the 100 Greatest Football Players. He currently works on behalf of ex-players as part of the Hall of Fame Player's Association. He also was named as one of the members of the NFL's all time 75th anniversary team in 1994. NFL Network's "Top 100: NFL's Greatest Players" named him the 82nd greatest NFL player of all time. He won the Bronko Nagurski Legends Award in 2008. ↑ "Who Were the Greatest Latin American Born Players in NFL History?". Retrieved May 23, 2016. 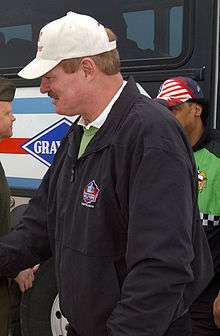 Wikimedia Commons has media related to Ted Hendricks.